The copper-platinum-bromine bullet is a new entry in our Making-It-Move competition, see Part VI here and brought to you by Liu & Sen of The Pennsylvania State University (DOI). The bullet is a 500 micron copper nanorod with a platinum tail produced from a known alumina template material. The technology behind this template is of interest by itself. Solid aluminum is anodized which means that the formation of the oxidized outer layer (alumina Al2O3) is accelerated. By selection of just the right solution a nanopothole array forms on the outer layer by a process of dissolution. A second anodization step deepens these holes which can then be used as a template. The bullet was (400 micron length, half a micron diameter) constructed from the alumina template by first a copper sputtering process. Then copper as copper sulfate was electrodeposited filling the holes to a certain depth. In step two palladium as palladium chloride was also electrodeposited, the copper outer layer was then etched away (ammonium persulfate) and finally the alumina matrix was removed by a sodium hydroxide solution releasing the bullets! When submerged into a bromine pool the bullets propel themselves forward powered by self-electrophoresis. One equation in the redox reaction responsible is oxidation of copper to the copper ion. 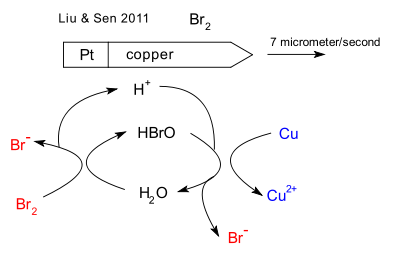 The other equations are reaction of bromine with water to hypobromous acid (HBrO) and HBrO reduction to the bromine ion and again water. With hydrogen ions moving from the copper part to the platinum part and the bromine ions traveling in the opposite direction the nett bullet movement is caused by electro-osmosis. The top speed is 7 micron per second with the copper fuel spent within a minute. Watch the movie (also in supporting info) for some dramatic footage of purple specs floating around in a purple square.